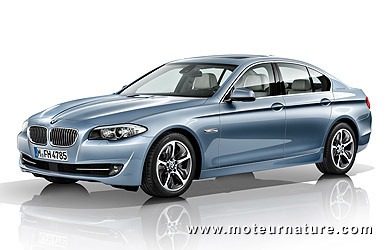 BMW ActiveHybrid 5, who will buy it? 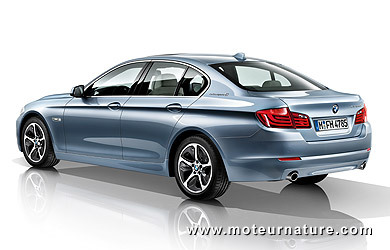 BMW is the undisputed world leader in sports sedans but it hasn’t been successful with its hybrid models yet. Its X6 hybrid has just been terminated because of slow sales, and its ActiveHybrid 7-series doesn’t find many buyers either. In Europe, people looking for good fuel economy buy diesels. BMW’s hybrids aren’t any better, while being much more expensive. That make few drivers considering them. All this will change when the fantastic i8 plug-in hybrid will be available, but this won’t happen before 2014. 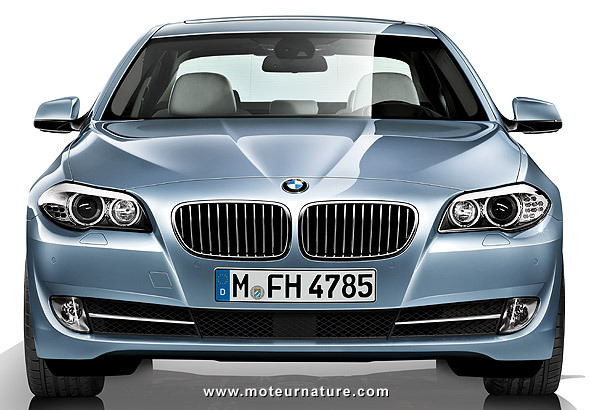 Waiting for it, here’s a new hybrid based on the 5-series. It doesn’t look much different from the standard model, save for a large logo behind the rear window. This ActiveHybrid 5 is a conventional hybrid, Prius-like, though less accomplished. It can drive 2.5-mile with its gas engine shut off, at speeds below 37-mph. So we guess the best way to use it will be like a Prius, without using the EV-mode, quite simply because it’s too limited, though better than the Japanese which can only drive 1-mile at speeds below 30-mph in EV mode. 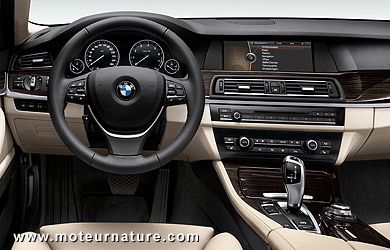 Compared to the Japanese hybrid, BMW put a clear emphasis on performance, it chose the the gas engine of the 535i to begin with. A 3-liter inline-6, it has 2 turbochargers to produce 306-hp and 295-lb/ft of torque at very low revs. The electric motor makes 40-kW (55-hp) and 155-lb/ft, altogether, the driver has 340-hp and 332-lb/ft under its right foot. Under the hood, the cover-all proudly shows the car hybrid’s credentials, though it’s only there for the look. Actually, the electric motor is located between the engine and the gearbox, at the very end of the transmission’s casing. There are no hybrids parts visible on top of the engine. The lithium-ion battery sits below the trunk’s floor, so you won’t see it either, though you’ll never forget that it’s there. Trunk space is reduced by about a quarter. You’ll have to travel light but lots of equipment might compensate. Four-zone air conditioning, soft close automatic doors, large electric glass sunroof, electric opening of hood and trunk, this is a luxury automobile. Yet all these equipments are available on other 5-series. We have to ask what makes the ActiveHybrid 5 different from its siblings. Is it performance? It isn’t. 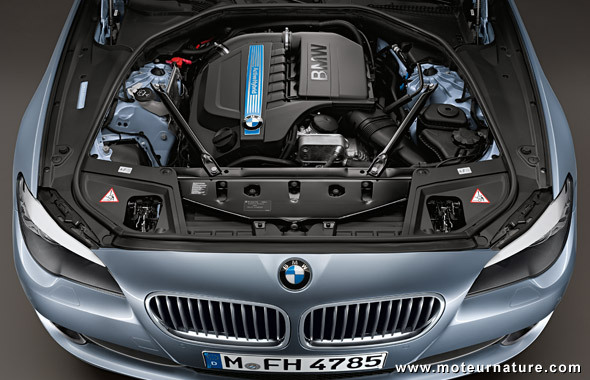 Compared to the 535i which has the same gas engine, the hybrid version adds 34-hp and 364-lbs. Standing start km is absolutely the same in both cars. 25.5 seconds. It has to be fuel economy then. Official European fuel economy figures have been released. In the extra-urban test, the 535i gets 39 mpg, while the ActiveHybrid 5 gets 35 mpg. You read it right. The hybrid version has worse fuel economy than the standard model. Fortunately, things get reversed in the city-driving test, where the 535i gets 22.5 mpg and the hybrid car gets 41 mpg. We know those fuel economy tests are far from perfect, but it’s a huge failure for BMW that its hybrid model gets worse fuel economy than its non hybrid car in official testing. Combined fuel economy ratings give the hybrid an advantage, 37 versus 31 mpg, but it’s much disappointing that the hybrid car must remain in the city to prove its worth. Shouldn’t an hybrid be more fuel efficient in all driving conditions? We hadn’t thought of the 5-series as a city car before. We remain confident that drivers looking for good fuel economy will keep on buying diesels, whereas those looking for high performance, will keep on buying the fabulous M5. 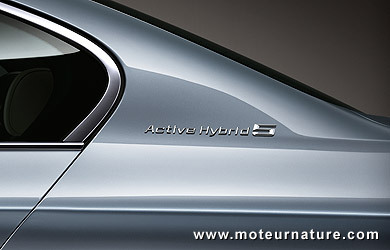 But we can’t imagine who will buy this ActiveHybrid 5. Understanding the importance of power of an hybrid vehicle in the present market, BMW motors has come out with its first Hybrid in 2010 in the form of ActiveHybrid X6.